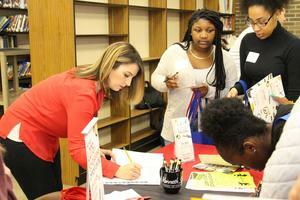 The B-L Rotary Club sponsored its annual Career Fair at B-L High School on Tuesday, February 5th. The B-L Rotary Club sponsored its annual Career Fair at B-L High School on Tuesday, February 5th. More than forty businesses and agencies participated in the event, which was a collaborative effort between Rotary members and administrators and guidance staff at B-L High School. One of the five avenues of Rotary service is “Vocational,” so the B-L Rotary Club is proud to partner with the high school to help students learn about career and vocation options so that they can make informed decisions about their futures. All grade levels participated in the event. Students prepared résumés and worked on their soft skills (such as their interpersonal, social, and communication skills) in preparation for the career fair. They also had the opportunity to hear from Keller Kissam of Dominion Energy who presented to the entire student body at the Fine Arts Center. Mr. Kissam serves as President of the Electric Operations of the Southeast Energy Group. His unit is responsible for electric transmission and distribution operations, including fossil hydro generation. He spoke with students about the importance of service to others, teamwork, a good work ethic and a positive attitude and said that these core, guiding traits create strong leaders across all job fields. In the past, the Rotary Career Fair has opened up internship, apprenticeship, and work opportunities for Lexington Three students through connections made at the event.